Skinneeez floppy toys have double squeakers?!? Yes, and my dog does double back flips when I take these toys out for playtime! Well, okay…but he does prance around and jump up to grab them if I take too long to start the play. He also expresses great gusto in attacking the limp creatures as they lie on the floor, doing nothing to attract his attention. Giving them a good thrashing may be his way of showing off his hunting prowess. The packaging was minimal and the two floppy toys were easy to extract from the simple card they were affixed to. In fact, as soon as I cut the body of one free from its tie, Tashi was jumping up to grab the hind legs. What I thought was really smart and something that keeps the dog’s interest is that after all the flopping action that comes from no stuffing and squeakers at both ends, each squeaker has a different tone! Nobody has mentioned that! I squeaked one, then both at the same time and Tashi was rapt with attention, anticipation, focus. It’s such a pleasure to watch him get a little wild, and puppy like at the age of 8, and the same reaction this year at 9. I received two items from the “forest series”. The long-haired fox, was 23” from nose to tail, and had very plush fur, and from their “mini” series, a ferret, around 10” which had short hair that was not plush. I noticed these toys were made in China, as are a majority of items we use every day. I looked them up on HeathyStuff.org and the Spot Pet Products company who makes these toys was not listed as having toxic or unsafe qualities in this product. Also the color used in the dyes is not the bright variety which have been shown to contain harmful ingredients. I checked both toys to make sure no fur came out. I had found a couple of spots where little tufts of the plush fur came out, and after going over it thoroughly, found no more loose tufts. I watched my dog play, checked the toy again after some tugging and lots of tossing and shaking and it was fine. There was nothing found loose on the ferret. After a year of everyday use, I can sincerely recommend this product, especially for small to medium dogs! Skinneeez Stuffingless Dog Toys. 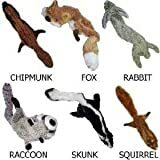 Bring out your dog’s natural hunting instinct with our realistic Skinneeez animals. Dogs will enjoy hours of entertainment flip-flopping these stuffing-free Skinneeez. All Skinneeez toys have 2 squeakers – one in the head and one in the tail for double the fun. Styles: Fox, Raccoon, Skunk, Chipmunk, Rabbit, and Squirrel. Size – 27 in Long. Finally, no more stuffing all over your floors – dog toy is stuffing free * Flattened shape feeds your dog’s prey instinct * Features two squeakers, one in head and one in tail. Unique dog toys have no stuffing for your dog to pull out! Enjoy less mess around the house with these super soft, flat friends. Extra-long, extra-floppy body is easy to Grab, hold, and carry by almost any sized dog. Plush toys measure about 27″ long! IncludeS squeakers in head and tail. Machine washable. Styles: Fox, Raccoon, Skunk, Chipmunk, Rabbit, and Squirrel. THIS LISTING IS FOR THE SIZE, COLOR AND STYLE IN THE LISTING TITLE. Find more Spot Skinneeez Stuffingless Dog Toys products on Amazon!